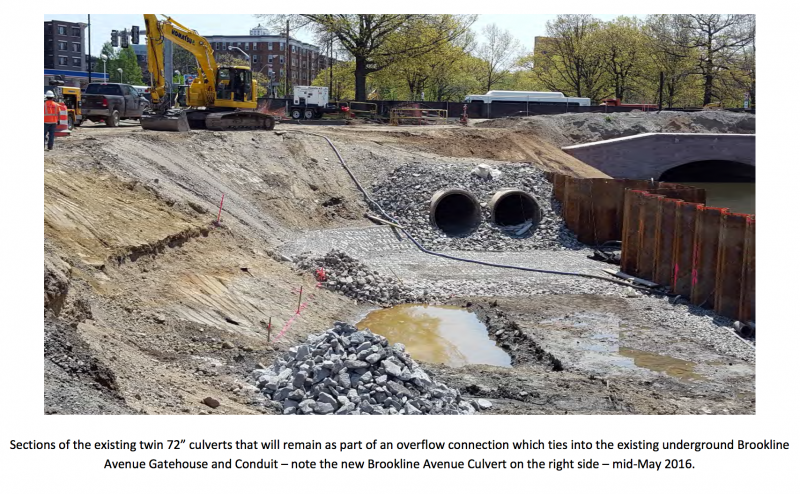 Since the May update, the project site is looking very different. 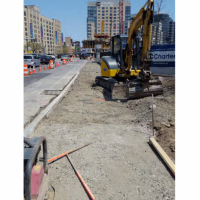 There is new pavement on the roadways and new sidewalks in the immediate area of the project. 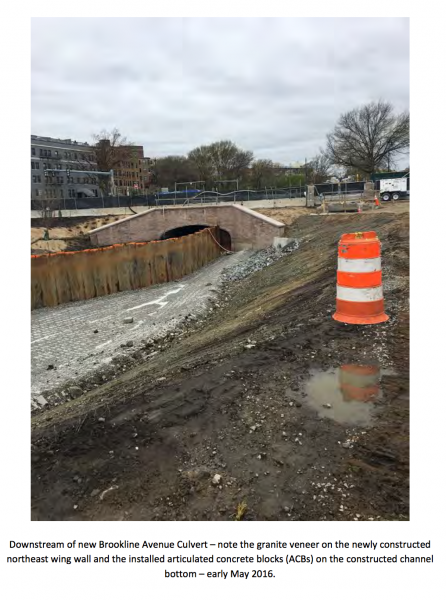 The jersey barrier and construction fencing with the black fabric has come down in most of the area of the project site, replaced now with temporary landscape protection fencing. 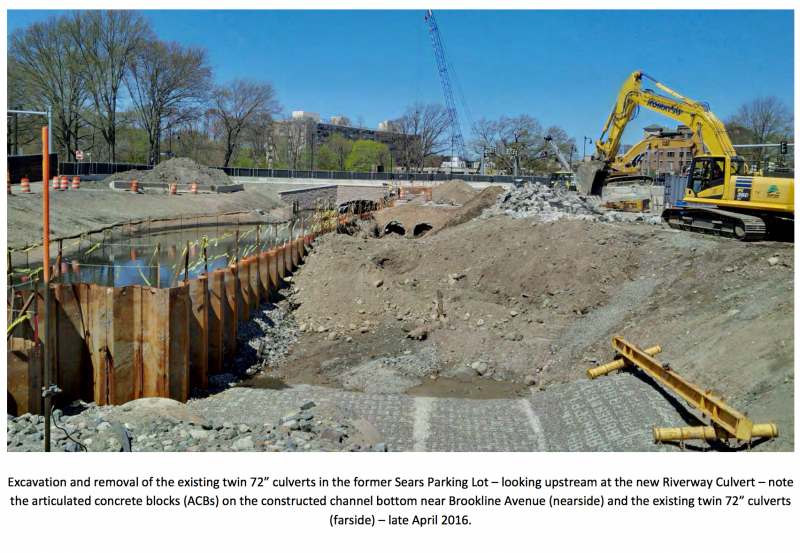 Most dramatic of all is now there is water on the both sides of the former Sears Parking Lot. 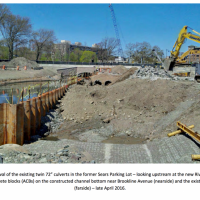 Since the last update, the former parking lot has been daylighted and the flood risk management (FRM) channel constructed. 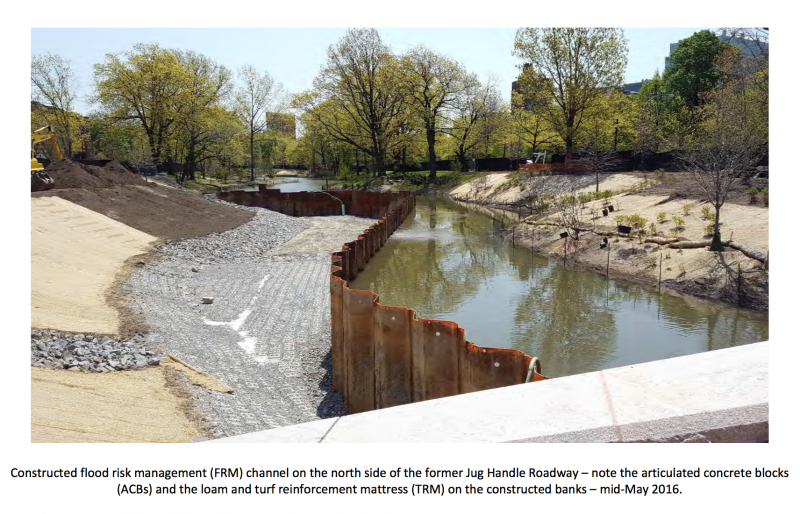 The Muddy River is actively flowing through the right side (looking downstream) of the channel and water was pumped onto the left side in order to plant the wetland plants and in anticipation of extracting the river diversion sheets, which will take place this week. 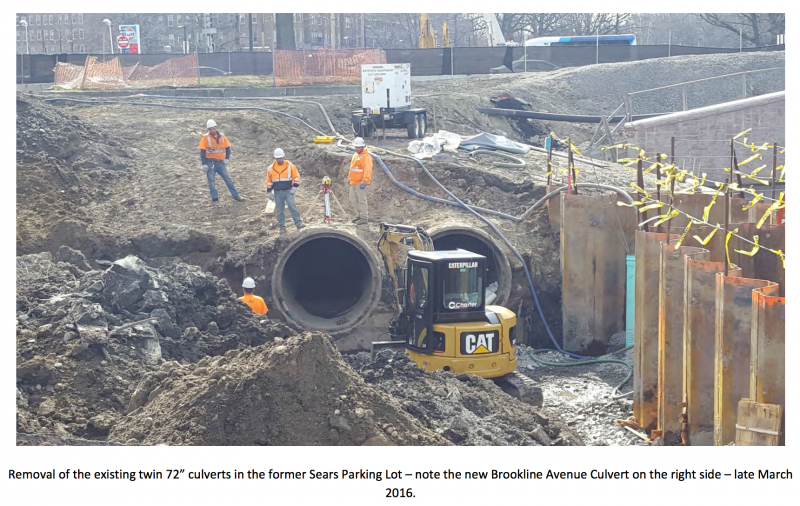 The former Jug Handle Roadway area has been completely daylighted and the river diversion sheeting removed so now the Upper Fens Pond extends right through the Brookline Avenue Culvert and ties into the newly created river in the former Sears Parking Lot. 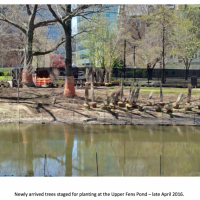 Plantings continue to be installed at both the Upper Fens Pond, the former Sears Parking Lot, and the Riverway work areas. 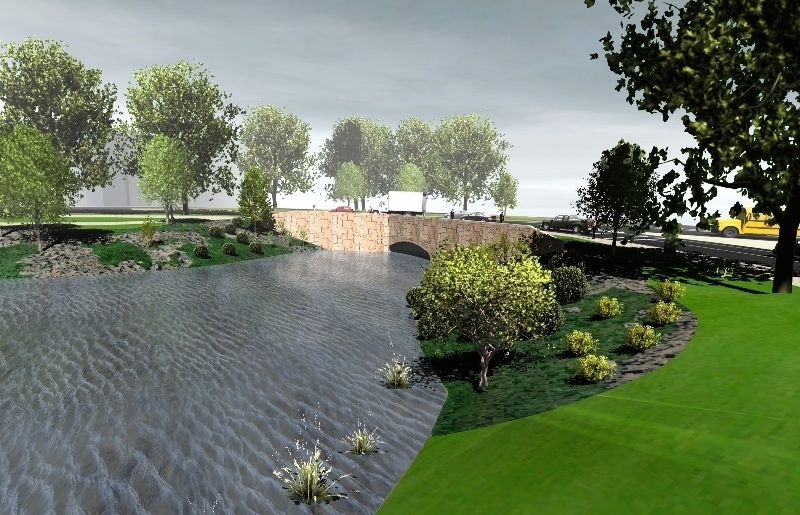 We will begin to perform inspections and correcting punchlist items (minor deficiencies) in the next few months. 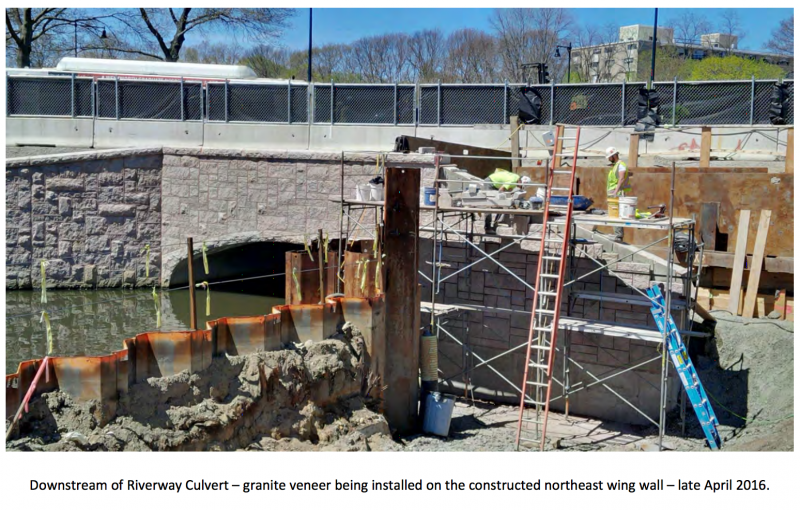 Thank you for the continued interest and support as we head towards completion of this project – late June! 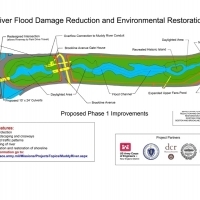 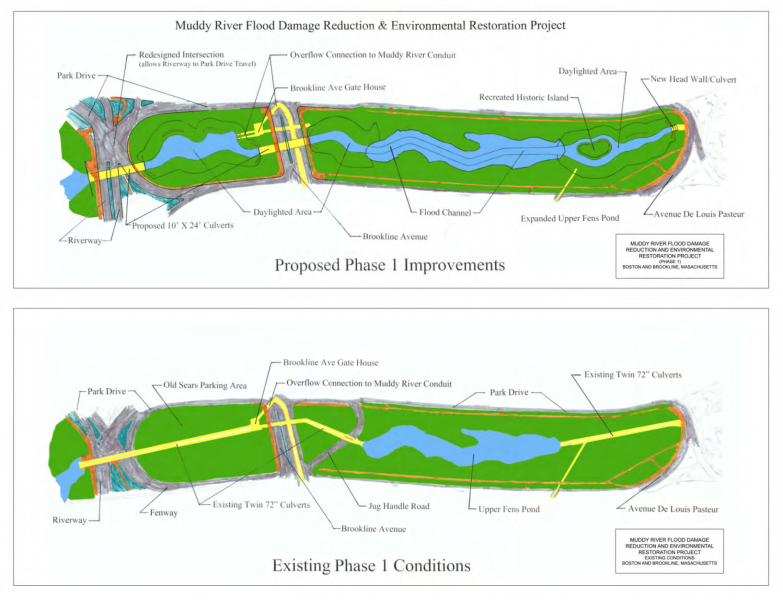 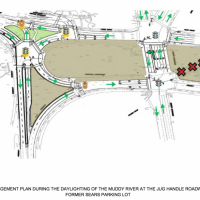 General: The Muddy River Flood Risk Management (FRM) & Environmental Restoration Phase 1 Construction Project is located in the footprint generally between the Riverway downstream to Avenue Louis Pasteur. 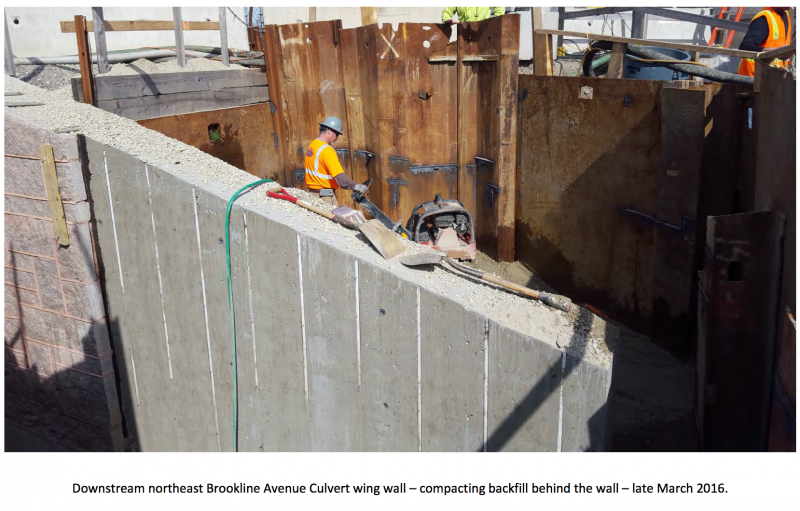 The major project components involve the installation of a 10-foot by 24-foot box culvert under the Riverway roadway, the installation of 10-foot by 24-foot box culvert under the Brookline Avenue roadway, daylighting of the area between the Riverway and Brookline Avenue, and daylighting of the area between Brookline Avenue and Avenue Louis Pasteur. 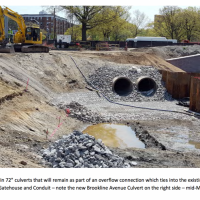 Daylighting is the removal of existing twin 72″ culverts and excavation of the area to return the waterway to a natural state. 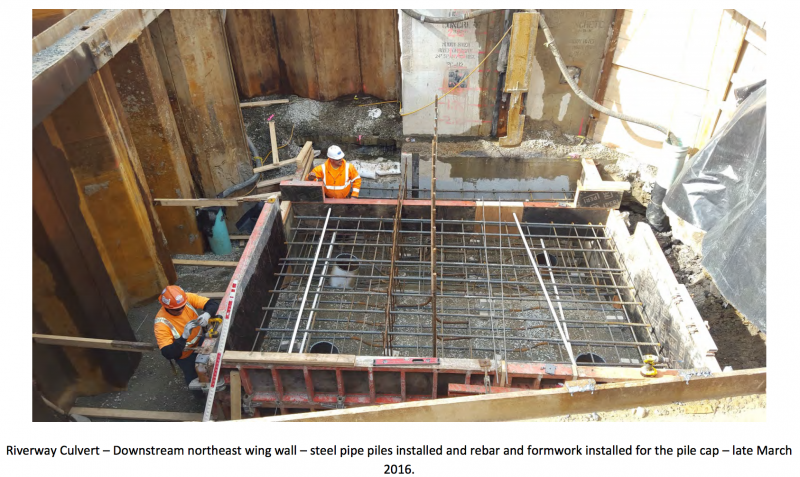 This Notice is intended to identify the general construction activities that will be performed in the next 90 days. 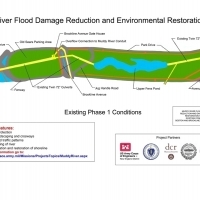 A figure that shows the existing conditions and the proposed improvements is at the end of this report. 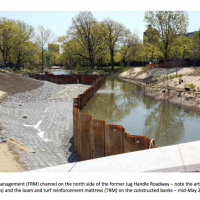 At the upper end of the project limits, downstream of the Flow Restriction Control Structure (FRCS), the sediment has been removed in order to construct the northside of the flood risk management (FRM) channel, to include stone protection/bank stabilization, at the Riverway. 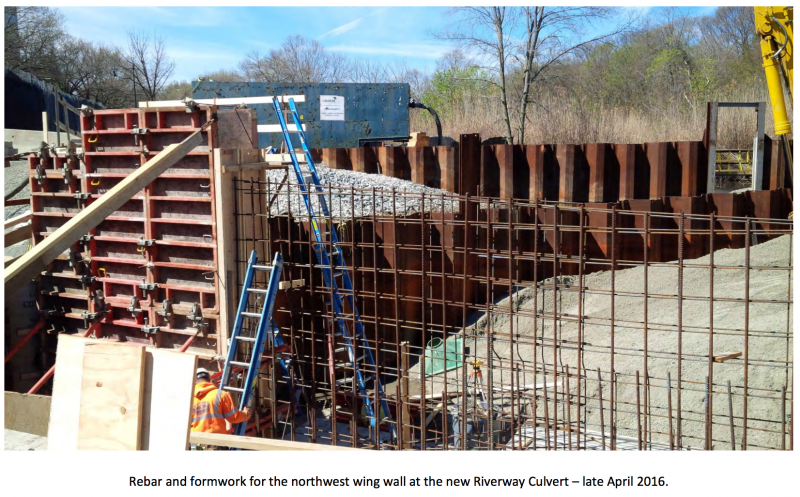 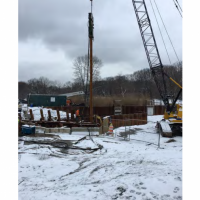 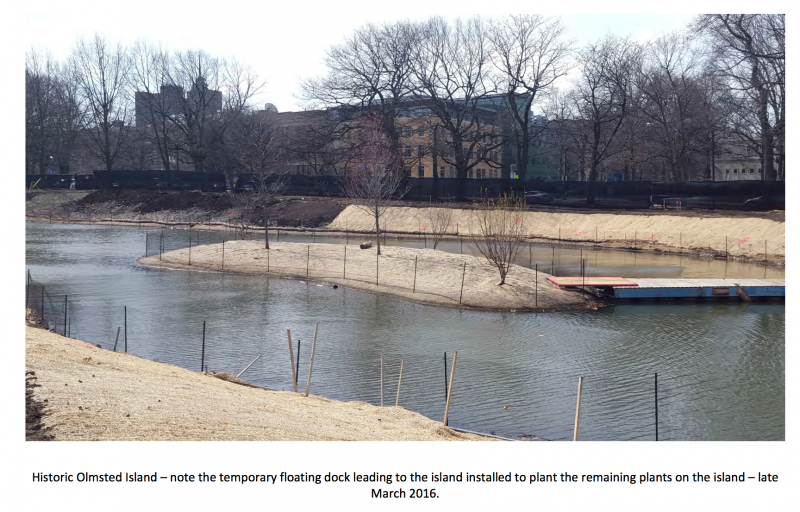 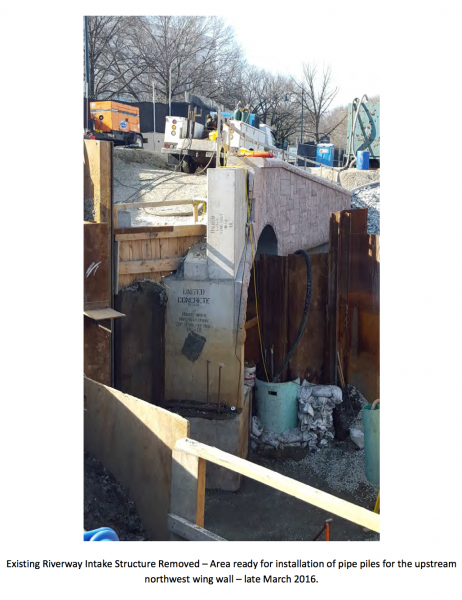 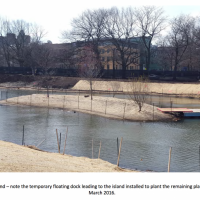 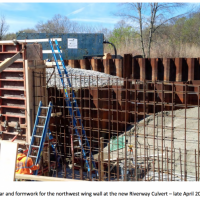 In addition, the existing Riverway Intake Structure was removed mid-March; and the upstream northwest wing wall of the new Riverway culvert was cast and granite veneer installed late May. 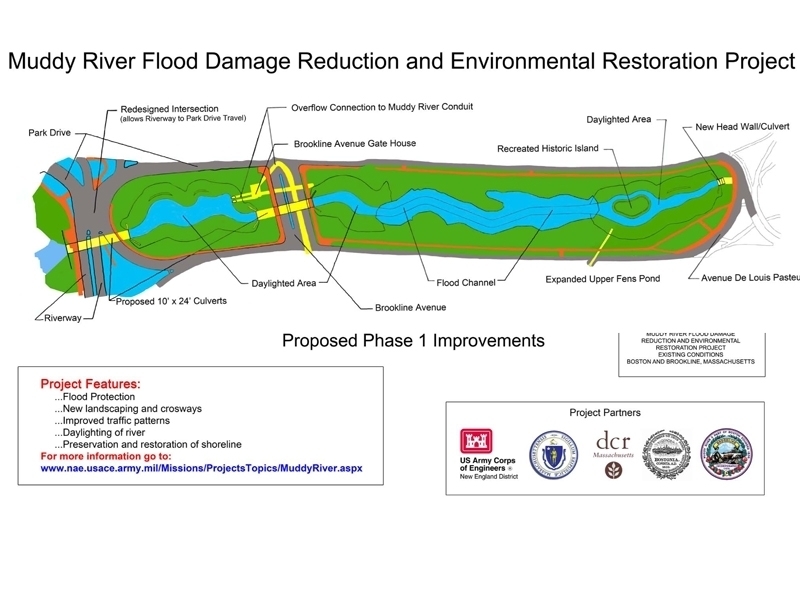 Upcoming activities include continued final grading and planting of this area; installation of the temporary landscape protection fencing and permanent steel handrail at the culvert headwall; and the extraction of the river diversion steel sheeting which will allow the Muddy River to flow in the newly constructed FRM channel. 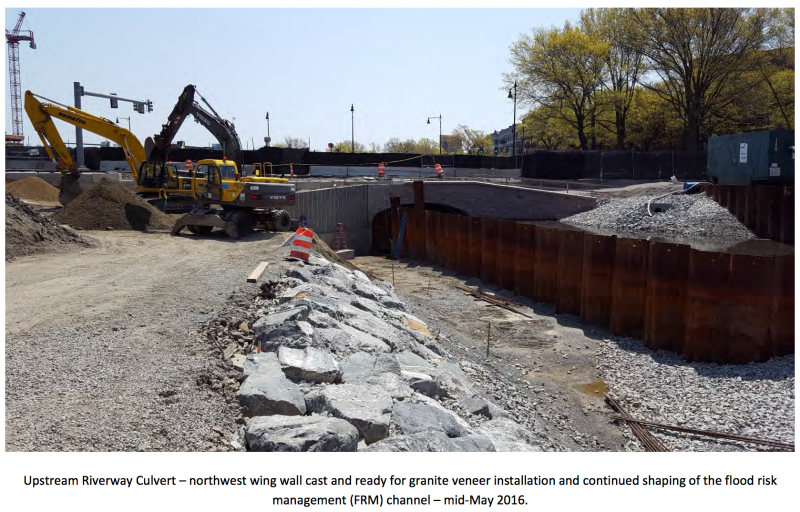 With the construction of the downstream northeast wing wall of the Riverway Culvert; the relocation of the existing 24” sewer line; and the excavation and removal of the existing twin 72” culverts in the former Sears Parking Lot, the lower portion of the FRM channel on the northside was completed at the end of May such that it allowed the filling of the northside with the river. 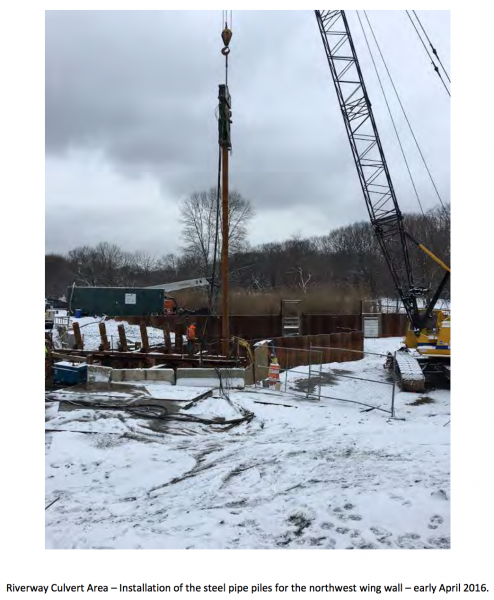 This allowed for the planting of the wetland plants in the last week. 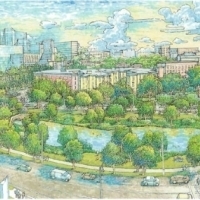 Upcoming activities include final grading of the upland banks; continued planting on the upland areas; final construction of the meandering path around the river; installation of the temporary landscape protection fencing and permanent steel handrail at the culvert headwalls; and the extraction of the river diversion steel sheeting which will allow the Muddy River to flow fully in the former Sears Parking Lot. 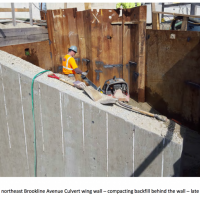 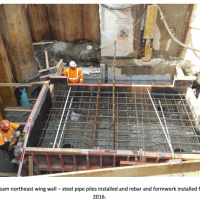 With the removal of the existing twin 72” culverts, the downstream northeast wing wall of the Brookline Avenue Culvert was constructed early May and the FRM channel constructed in mid-May. 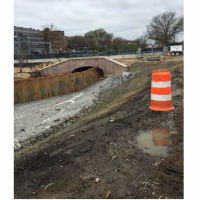 Since that time, plantings have been installed and the river diversion steel sheeting was removed late May which completed the daylighting of the former Jug Handle Roadway. 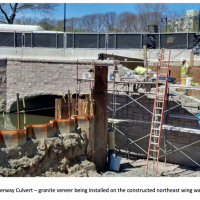 Upcoming activities include installation of the permanent steel handrail at the new downstream Brookline Avenue Culvert headwall. 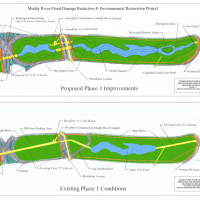 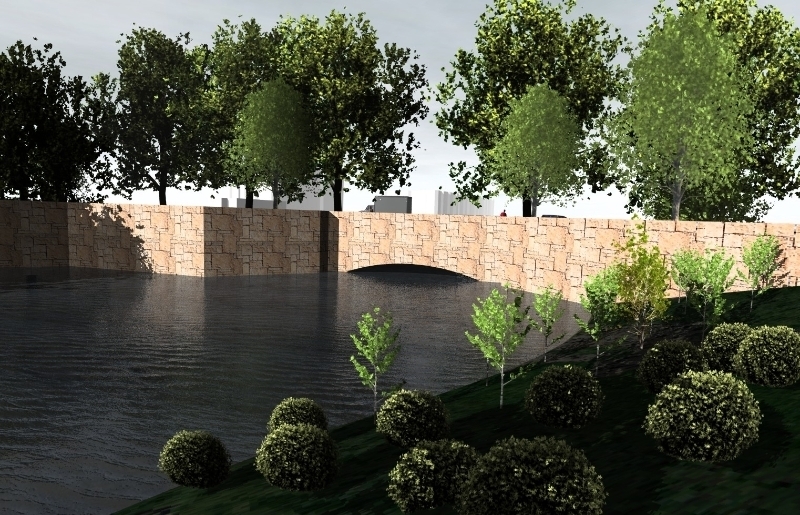 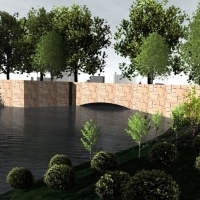 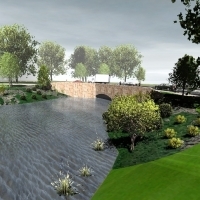 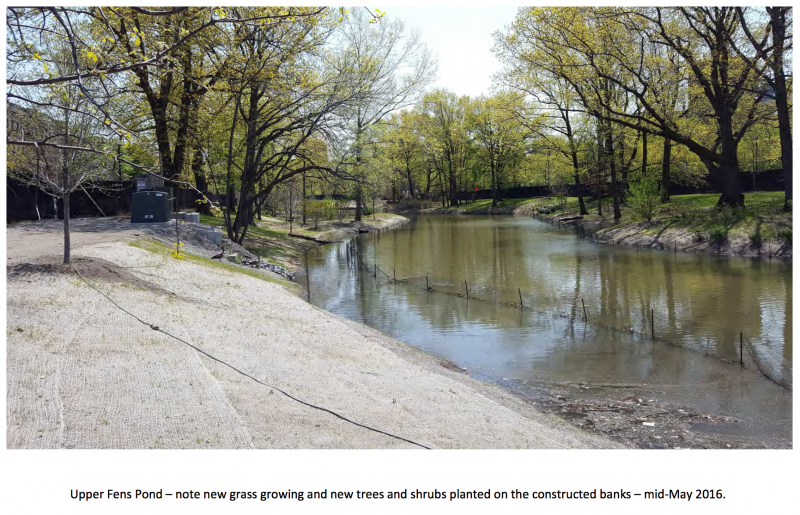 In the Upper Fens Pond area, upcoming activities will include continued inspection, maintenance and care of the plantings; restoration of the impacted landscaped areas; and completion of the temporary landscape protection fencing and installation of the permanent steel handrail at the upstream Avenue Louis Pasteur culvert headwall. 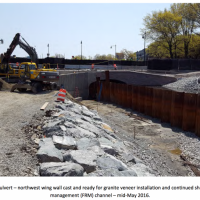 Downstream of the Avenue Louis Pasteur Culvert, the plantings and the temporary landscape protection fencing have been installed. 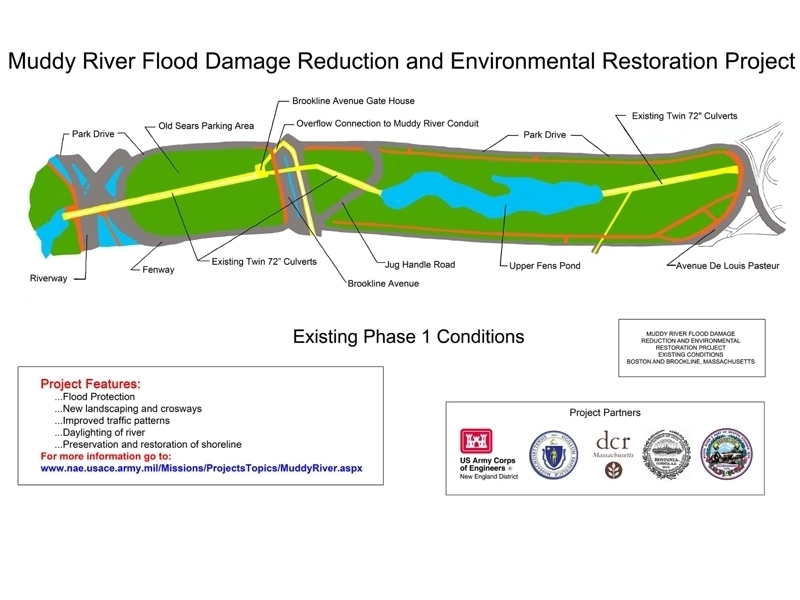 Upcoming activities will be the restoration of the impacted pathway and landscaped areas once equipment and storage are demobilized. 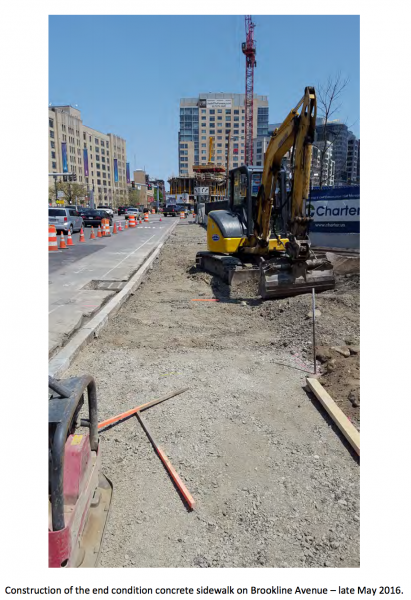 Site work around the project – permanent sidewalk reconstruction on Brookline Avenue and Park Drive was completed early June; and final pavement on the majority of the roadways was completed early June. 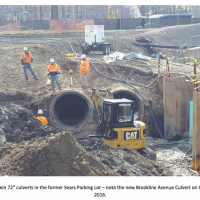 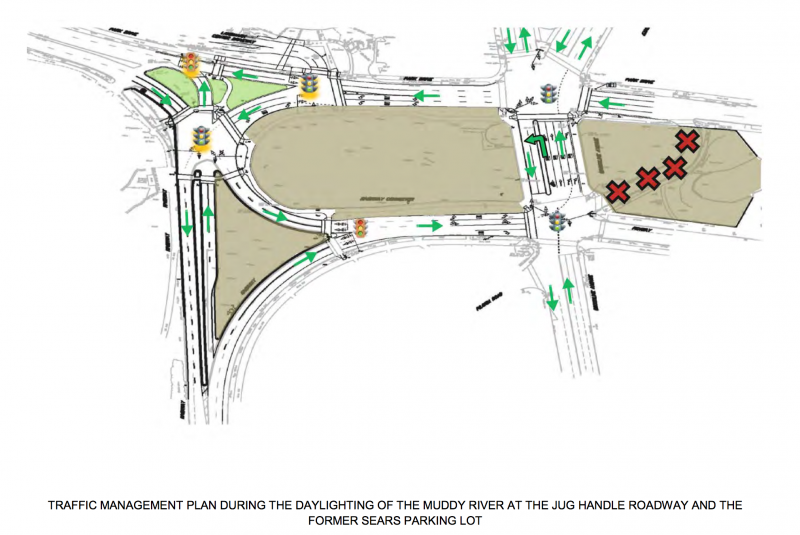 Upcoming activities include construction of the asphalt sidewalk in the vicinity of the new Riverway Culvert; final pavement on the stretch of Park Drive in front of the Landmark Center; and permanent striping of the newly paved roadways. 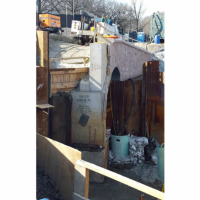 In the months of July and August, final inspection and correction of punchlist (minor deficiencies) items will be completed throughout the project. 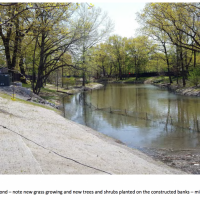 At the end of this notice we have included some pictures that show the Riverway, the former Sears Parking Lot, the former Jug Handle, and the Upper Fens Pond work areas. 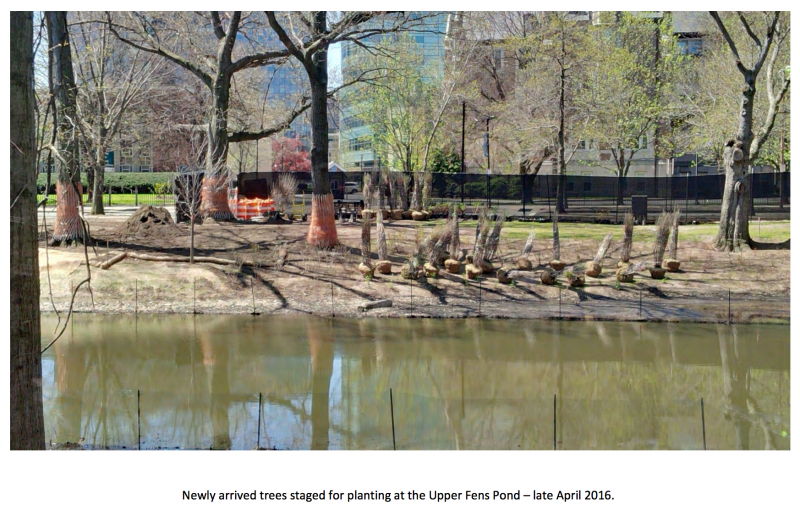 We thought folks would be interested in seeing the work occurring behind the fence.